Coolmore have a remarkable five Epsom Derby winners on our stallion roster in Ireland and one of them is Pour Moi, whose highly promising son Sacred Elixir (2g Pour Moi x Baltika, by Stravinsky) scored a resounding victory in the Group I BRC JJ Atkins Stakes at Eagle Farm on Saturday. A winner of two of his five previous starts, the Tony Pike trained Kiwi bred gelding was considered unlucky when a fast closing sixth in the Group II BRC Sires Produce Stakes at his first run in Brisbane last month. He proved the merit of that run in no uncertain terms when powering away to win the 1600 metre feature by three and a half lengths with Zac Purton in the saddle. "I had it won at the 700m,” Purton said. "When I was tracking-up coming into it beautifully and everyone else was all crammed up. I just kept him out of trouble. "He’s very raw. There could be a lot of improvement left in him or there could just be a little bit more. "But we know is going to improve to a certain degree. He’s a lovely big horse but he hasn’t quite filled out into his frame yet and mentally he’s still got to think about everything he’s doing. "Once that all comes together and he gets over a bit more ground and being by an English Derby winner he’s an exciting horse.” A $170,000 NZB Premier purchase for Raffles Racing/Mulcaster Bloodstock from the Wentwood Grange draft, Sacred Elixir has won three of six starts earning in excess of $450,000. Bred in the purple, Sacred Elixir is the first winner for well-bred Stravinsky mare Baltika, a winning grand-daughter of champion New Zealand mare Horlicks from the family of Group I winners Brew (Melbourne Cup) and Fiumicino (Australian Derby). "We’ve always thought he was an extremely promising horse,” Tony Pike revealed. "Being a two-year-old and wanting to get him over a trip we hadn’t been able to get him past 1400m so the JJ Atkins was the perfect race for him on a big track over the mile. 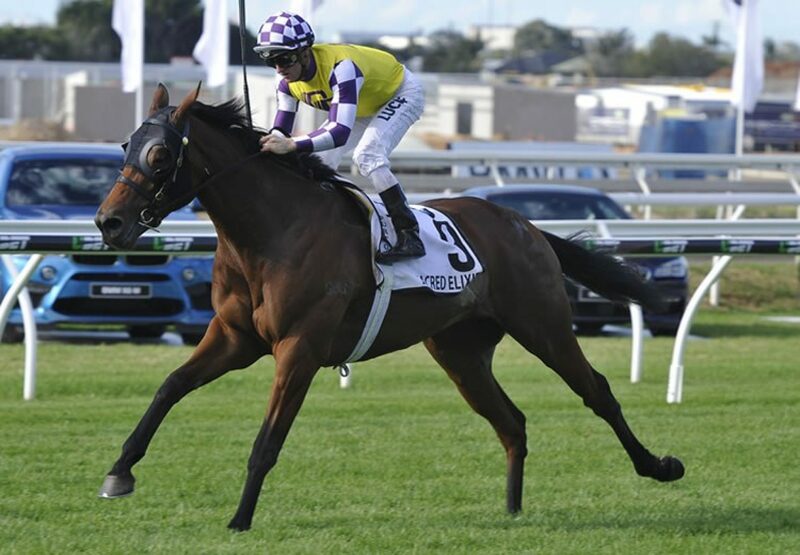 "The Victoria Derby is the long term plan with him. He’s got a real stayer’s pedigree out of Horlicks’ family. He’s a lovely big horse now and he’s only going to furnish more as he gets older.” Sacred Elixir is the first Group I winner for Montjeu’s Derby winning son Pour Moi, whose oldest New Zealand bred progeny are just two year-olds.